What Do HR Execs Think Trump Will Do to the ACA? | Challenger, Gray & Christmas, Inc. The survey, conducted in December among a small sampling of human resources executives from across the United States, was released Tuesday by global outplacement and executive coaching firm Challenger, Gray & Christmas, Inc.
“The human resources community is not against providing health care to employees. The fact is that employers benefit from a healthy workforce, so there is a vested interested in ensuring that employees have access to health care. What they are against, however, is a maze of new and complex rules and regulations that make their already difficult job far more taxing,” said John A. Challenger, chief executive officer of Challenger, Gray & Christmas. The survey found that 67 percent human resources executives have been anticipating significant changes to ACA since Trump’s election. While most HR executives foresee significant changes, 28 percent believe it will be eliminated entirely. Only 5 percent said they believe the law will remain untouched due to popular demand. Of human resources executives who reported that significant changes will occur, 39 percent foresee the elimination of the Cadillac tax and the employer-sponsored and individual mandates. Additionally, 17 percent stated some parts will be kept and some repealed, but did not specify which aspects. Some of the ACA components targeted for elimination in last week’s Congressional vote, include Medicaid expansion safety nets and funding that provides subsidies to middle-income Americans to offset the cost of insurance premiums. So far, Congressional actions have not caused HR departments to alter their own policies. The Challenger survey found that almost 80 percent have yet to make plans for a repeal of the ACA. Meanwhile, 61 percent said they will keep aspects of their policies that were enacted for the law. “Many companies and their human resources departments are in a holding pattern. It is difficult and, frankly, counterproductive to spend time and resources developing plans, when it is nearly impossible to know what the final health care law will look like,” said Challenger. Regardless of how the ACA’s replacement will look, the Challenger survey found that many HR executives anticipate their companies’ adopting some of its components in their benefits packages. Of the requirements HR executives plan to keep, 60 percent noted they will continue to cover children until age 26 and 100 percent said they will keep coverage for pre-existing conditions. Additionally, 13 percent anticipate creating completely new policies upon elimination of the law. This is not to say HR executives do not have some questions. According to the Challenger survey, 43 percent said their biggest concern is whether mandatory reporting to the IRS will continue through the calendar year or cease immediately with the repeal of the law. 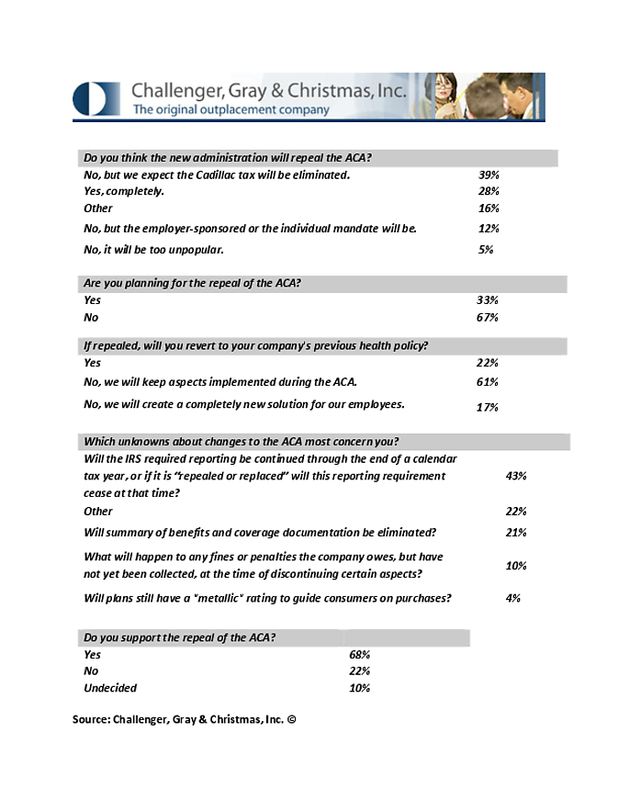 Another 21 percent questioned the fate of current documentation related to summaries of benefits and coverage. The elimination or significant alteration of the ACA is not Trump’s only potential impact to the workplace, of course. The president-elect has been an outspoken critic of government regulation and is likely to try to soften many of the rules and regulations enacted in recent years. For instance, the Department of Labor overtime exemption change that was recently blocked by a federal judge is unlikely to receive any support from the new administration and could be eliminated under a Trump administration. Additionally, Trump has not indicated whether wages, health, or family leave are priorities for his administration. Due to his campaign message on immigration and his choice of Jeff Sessions for attorney general, a critic of H-1B visas, it remains to be seen whether programs for foreign workers will see a significant overhaul. His Twitter spat last month with the union leader who represented many of the Carrier Corporation jobs that were off-shored may portend his future relations with unions.